We continue to support the manufacturing development and future implementation of the innovative CD4 test developed at Burnet. It is now licensed to Omega Diagnostics for manufacturing and sale worldwide, with studies supported by Saving Lives at Birth and the NHMRC. 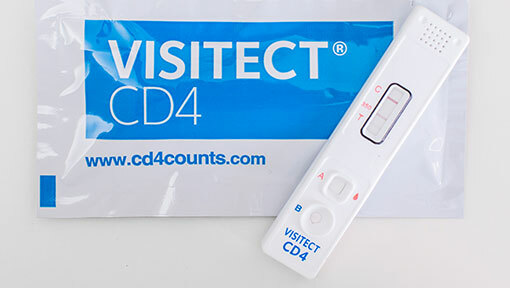 VISITECT® CD4, developed by Burnet Deputy Director Associate Professor David Anderson, Burnet Associate Director Professor Suzanne Crowe AM, and their team, is an affordable point-of-care (POC) test aimed at reaching HIV-positive patients around the world. Before HIV infected patients are treated with anti-retroviral drugs their CD4 T cells must be below 350 cells per microlitre (according to current WHO treatment guidelines). The conventional way to measure CD4 T cell levels is through sending blood samples to be tested via flow cytometry (FACS) which is an instrument that requires large capital investments to purchase and then train scientific staff to maintain and operate. Most laboratories and clinics in the countries most affected by HIV and AIDS are unable to monitor CD T cells, particularly in remote and rural settings. Associate Professor Anderson and his team developed a novel rapid point of care for the measurement of CD T cell levels in a similar format to a pregnancy test that only requires a finger pick of blood. The test does not require highly trained personnel to operate and can be performed in remote settings by health out-reach workers giving a simple treat or no treat result. The test works by measuring the amount of cell associated CD4 using a sandwich capture assay where the sample line is checked against the test line to give a treat or no- treat result. Translating research: The journey from concept to market for a life-saving diagnostic.